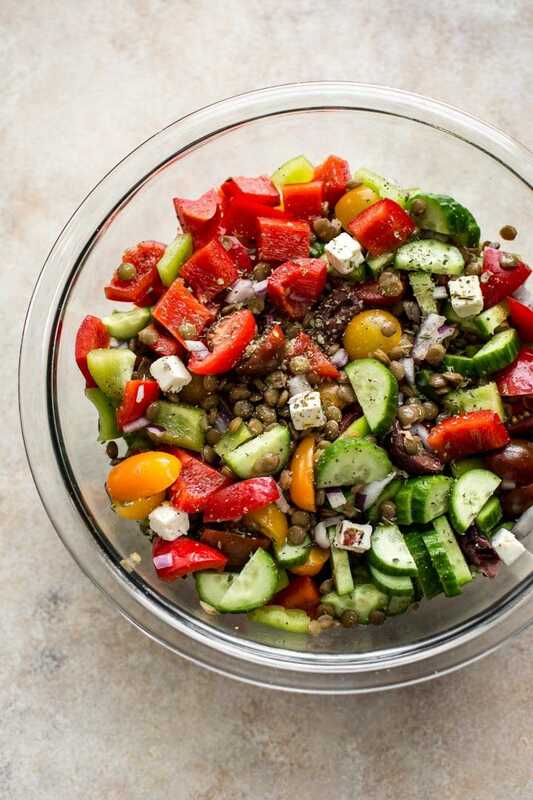 This Mediterranean lentil salad recipe makes a tasty and light meal or side salad. It’s simple to throw together and filled with fresh veggies and Greek flavors. I figured it was time to add another healthy lentil salad to me repertoire. I have a vegan one that is really fresh and perfect for summer, but I hadn’t cooked lentils at all since I made that one. It’s a shame, because lentils are good for you, filling, and low in calories. I used to love them as a kid, actually. I really need to get back to cooking them more regularly. Lentil salads are great for making ahead or meal-prep so you have healthy food for a few meals. Pro tip: Don’t salt the water that you’re cooking the lentils in – it can change the texture of the lentils. 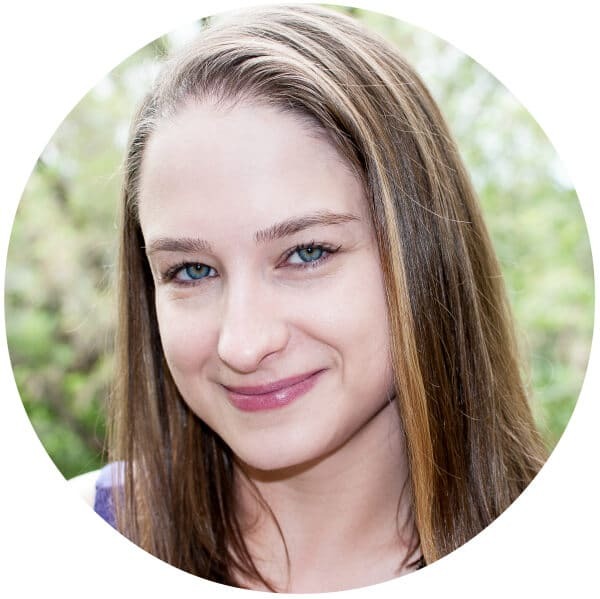 I really like this flavor profile, and I have a few similar salads that you may like as well – my Mediterranean quinoa salad, my Mediterranean orzo salad, and my Mediterranean chickpea salad. Mediterranean flavors are some of the best in the world! 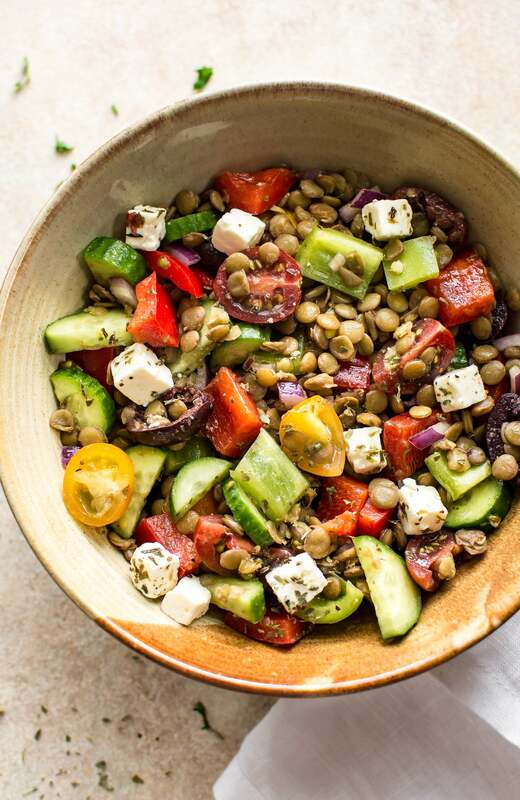 I hope you will give this Mediterranean lentil salad recipe a try! 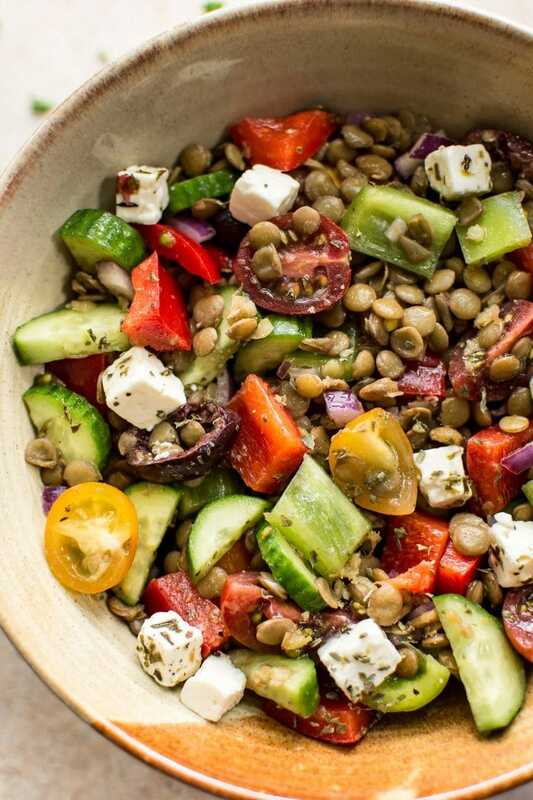 This Mediterranean lentil salad recipe makes a tasty and light meal or side salad. It's simple to throw together and filled with fresh veggies and Greek flavors. Rinse the lentils and add them to a medium pot along with the 2 cups of water over medium-high heat. Bring to a rapid simmer then reduce the heat so it gently simmers for 30-40 minutes or until the lentils are cooked. Meanwhile, prep the other ingredients and add them to a medium salad bowl. Once the lentils are done (they shouldn't be mushy, but they shouldn't be too firm either), drain them and rinse with cool water and then drain them again and add them to the salad bowl. Add the dried oregano, red wine vinegar, and olive oil to the salad (you may need to add more depending on your taste preferences). Add salt & pepper to taste - I am pretty generous since I do not salt the lentils prior to cooking them. Toss the salad. Serve immediately or chill first. Salad will keep for a few days in the fridge. It's best not to salt the lentils until after they're cooked. Keep this in mind and don't forget to give the salad plenty of salt for flavor. Your lentils are gorgeous. I need to practice more. I swear whenever I make lentils it tastes good but gets mushy pretty quick. Also I love that feta is at the top of your list up there-as it should be!! Feta forever! This looks so good, I wish I were having it for lunch! Love the Mediterranean flavors of this salad Natasha. This would be delicious for lunch or dinner! So nice and hearty! I can’t use peppers due to (my husband’s) allergy to them. What can you suggest as a substitute? Your recipe looks fantastic and I definitely plan to try it. Thanks. Hi Jean! You could definitely just skip them altogether or replace them with another crunchy veggie that you like. If you’re not too worried about keeping the salad traditionally Greek, I think celery would add a nice crunch and flavor to it. Hi Lucille! You could definitely give those a try. Make sure to drain them well. Hope you enjoy the salad! 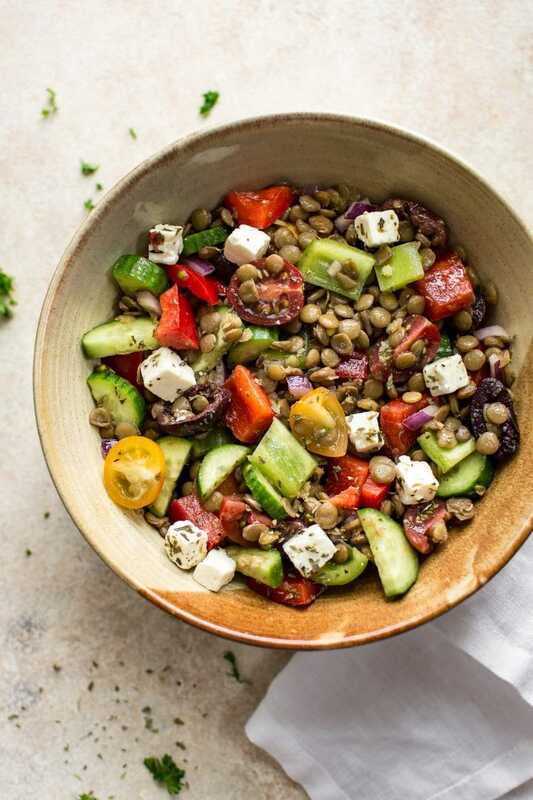 I grew up eating lentil salads but they never looked this good! I made this just now for dinner and it tastes heavenly.